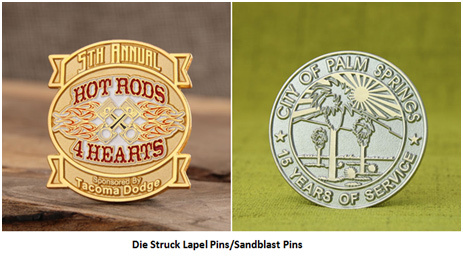 To the average person who is not familiar with pin, they will confuse die cast lapel pins and die struck lapel pins. In fact, this is different, but this difference is often unrecognizable. The main difference is that the die cast lapel pins can be sculptured to a 3D shapes, sizes and any number of cutting set. In simple terms the 2D Die struck lapel pins will have two levels (A projection plane and A concave plane). The Die casting pins also known as 3D cast pins, Instead of only one raised area and one recessed area. Die castings are slightly more expensive than ordinary enamel pins, and the processing of the die is a little expensive—one is injection of a liquid metal into the mold vs one is stamped with thin metal. Die struck pins are exactly like hard enamel pins or soft enamel pins, except without the color! Traditionally, the raised metal surface is highly polished to achieve a glossy effect, while the recessed area is sandblasted for contrast. These lapel pins are of very high quality. They are durable, stylish, and can be brightly colored. Most often used to employee recognition awards, student recognition awards, service awards, anniversary markers, and as brand and marketing tools for businesses, organizations, and not-for-profits. How Are Our Die Struck Lapel Pins Made? Die struck pins begins with a simple metal plating color of your choice. Create a a special die with your custom designed symbol. Because of the soft nature of these metals, it can give it a sharp and detailed stamping effect. Then use a trimming tool to carefully cut out the outside shape of your lapel pin. Finally, we use hand sand blast the pin to make textures or “sandblast” backgrounds. The raised surface of your lapel pin will be polished to a mirror like finish and the background will be remains textured. This gives the unique appearance of the die struck pins. The die-cast lapel pin almost always has a real 3D look and will have multiple surface layers at multiple angles to create a 3 dimensional look and feel. Lapel pins of this type are usually created without enamel colors and are often made of gold, nickel, silver and other metals. Die casting process is considered to be flexible fine, you can reproduce any a beautiful images into a 3 d Custom Pin. Because it requires a careful tooling of detailed steel dies, so it is more expensive than other types of pins. Most often used to create complex shapes like animals, statues and religious icons or automobile replicas. 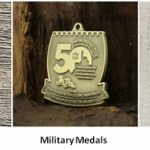 Die-casting also is appropriate for other items like Key chains, medals, challenge coins and more. How Are Our Die Cast Lapel Pins Made? The 3D cast lapel pin and Die struck pins are formed in different ways。3D pin is made from a rubber mold acceptable for molten metal, while die struck lapel pins are made by stamping metal a die. First, pour the molten metal into your design rubber mold at high pressure. The metals are liquid hot, then created by spin-casting (sometimes called centrifugal casting). Once the metal has cooled and hardened, from here each custom pins are polished to remove spurs, burs and any surface defects to create a clean smooth surface and a uniformly accurate final custom lapel pins. If you chose to include hard or soft enamel, it is added at this stage with a special syringe. Finally the 3D cast pins plated in a metallic finish. Popular looks include gold, silver, brass and copper. 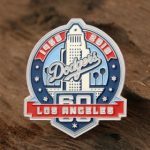 Both types of custom lapel pins are very popular, many clubs, organization, charities and sports teams order lapel pins in high volumes to assist with their fundraising efforts. 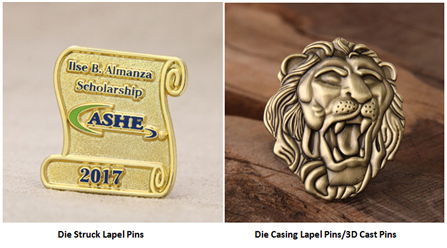 The decision to choose die cast lapel pins or die struck lapel pins will depend on your specific needs. Looking for custom lapel pins? Please visit GS-JJ.COM. Contact GS-JJ through the free price quote form on our website, by emailing Info@GS-JJ.com, or by calling 1-888-864-4755 toll-free.